I read quite a few of Willa Cather’s novels & short stories when I was younger but I hadn’t read her for a very long time. I think I bought this edition of The Song of the Lark because of the beautiful Hammershoi picture on the cover. I love his work, so cool & serene. Then, the book sat on the tbr shelves for nearly 10 years until I decided it was time to read it. I’m glad I finally got around to it. I was reminded of the reasons why I enjoyed Willa Cather’s writing all those years ago. The Song of the Lark is the story of the growth of an artist. Thea Kronborg is the daughter of a Methodist preacher in Moonstone, Colorado. One of seven children, her life is hard but not unhappy. Thea learns piano from Herr Wunsch, a German immigrant who has fallen on hard times. Thea’s Scandinavian heritage is something she has in common with many of the characters in Cather’s other novels. But The Song of the Lark isn’t a story of farming families living on the land. Thea knows she is destined for great things. Her determination to study music sets her apart from her siblings & her contemporaries. Of this feeling Thea had never spoken to any human being until that day when she told Harsanyi that “there had always been – something.” Hitherto she had felt but one obligation toward it – secrecy; to protect it even from herself. She had always believed that by doing all that was required of her by her family, her teachers, her pupils, she kept that part of herself from being caught up in the meshes of common things. She took it for granted that, some day, when she was older, she would know a great deal more about it. It was as if she had an appointment to meet the rest of herself sometime, somewhere. It was moving to meet her & she was moving to meet it. At first she studies piano but when, with the aid of a small inheritance, she goes to Chicago to study, her teacher, Harsanyi, recognizes that her voice is special & encourages her to study opera. Thea’s determination is formidable. She makes few friends because she is impatient with anyone who doesn’t work as hard as herself. She finds that she’s grown away from her family & the people of Moonstone. One friend of her childhood, Dr Howard Archie, remains steadfast & helps her to move to Chicago. Thea’s bond with Dr Archie was formed in her childhood & he encourages her to strive for more than a life as a piano teacher in small, dusty towns. Thea also meets Fred Ottenburg, the son of a wealthy brewer, who introduces her to a new circle of society where her talents are noticed & appreciated. The most important thing Fred does for her is not to fall in love with her – although he does – but to send her off to his family’s ranch in Panther Canyon, Arizona, to rest when she’s exhausted with overwork. This is the central experience of Thea’s life. She becomes entranced with the canyon, the remnants of the ancient people who once lived in the caves there. She spends all day walking & resting & thinking about her future. Not only did the world seem older and richer to Thea now, but she herself seemed older. She had never been alone for so long before, or thought so much. Nothing had ever engrossed her so deeply as the daily contemplation of that line of pale-yellow houses tucked into the wrinkle of the cliff. Moonstone and Chicago had become vague. Here everything was simple and definite, as things had been in childhood. Her mind had been like a ragbag into which she had been frantically thrusting whatever she could grab. And here she must throw this lumber away. The things that were really hers separated themselves from the rest. Her ideas were simplified, became sharper and clearer. She felt united and strong. Fred joins her in the canyon & Thea realises that she loves him. However, Fred is unable to marry her & Thea’s career leads her to study in Europe & a return, years later, to New York, where she meets Fred & Dr Archie again as she’s on the brink of a brilliant career. 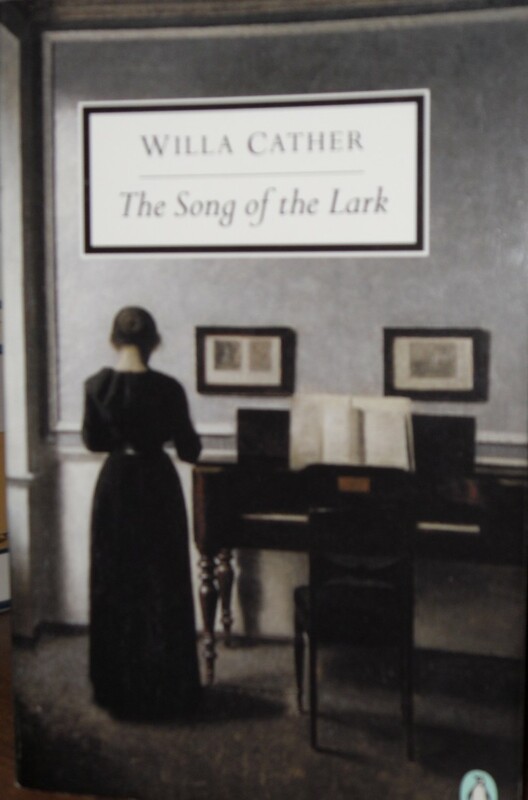 The Song of the Lark was a very personal book for Willa Cather. It’s more autobiographical than many of her other novels. Her childhood was very like Thea’s, although she was to be a writer rather than a musician. She also spent time in Walnut Canyon, Arizona with her brother, Douglass. This was the inspiration for Thea’s trip to Panther Canyon. It’s an early novel, published in 1915 &, in the Preface to the 1932 edition, she describes it as a partial failure because the early parts of the book about Thea’s struggle are more interesting than Thea’s success, “Success is never so interesting as struggle“. I’d agree that the first half of the book is more absorbing. I loved the picture of the small town life Thea lives with her family, her younger brother, Thor, who she drags around in his wagon, her friendships with Dr Archie, Ray Kennedy, a railroad man, & the Mexican immigrants who live on the edge of the town. Thea’s relationship with her calm, intelligent mother is also fascinating. Thea’s mother sees her daughter’s talent & does everything she can to support her. The section about Panther Canyon is the heart of the book. Thea’s explorations of the canyon, her almost ritual bathing in a pool of clear water, her delight in nature, the space she is able to create to think & plan her future are central to her life. The later sections in New York about Thea’s career are less interesting but I still enjoyed reading about Thea’s life & ambitions & about how she deals with the essential loneliness of an artist. I’m glad I finally got around to reading The Song of the Lark. I read several of her books years ago – O Pioneers!, My Antonia, Lucy Gayheart – but I’ve never read her New Mexico novels & I think I should do something about that. Oh, I love Hammershoi too – I think you may have been the one who introduced me to him! (Maybe it's because I'd like to feel as quiet and calm and peaceful as the women he paints!) I haven't read enough of Willa Cather – I need to remedy that. I did read Death Comes for the Archbishop a year or so ago, and was surprised at how much I enjoyed it, if only because the subject matter and the setting are far what I usually gravitate toward. I agree, Audrey, that cool serenity is very soothing. I think his wife often modelled for him & the mystery is why she's often turned away from the viewer. I haven't read DCFTA but it's one of the books on my list. This book is currently on my TBR pile. I enjoy Cather's books, and it is nice to read of an American West which is not just about gunfighters, much as I like westerns. I would certainly recommend Death Comes for the Archbishop as well. Thanks for recommending DCFTA, I will get to it one day! Hopefully you'll get to SOTL soon as well, Ed. I liked The Professor's House and Death Comes for the Archbishop, but I think I really prefer her prairie novels. I wonder if it's because the characters in those two books are men and the others I've read were women? Not sure. However, I'm about halfway through Song of the Lark and I'm loving it, I think it's my favorite Cather so far. I'm especially loving the parts in Chicago since I lived there for ten years. I think Thea must have lived in Andersonville which is a Swedish neighborhood on the north side, close to where I lived for several years. I don't know if the Art Institute really had the Venus de Milo though!! I still have a big stack of more Cathers on the TBR shelf and hope to read some more soon. I've read PH but it was many years ago. I think I prefer the prairie novels too. I'm glad you're enjoying Thea.